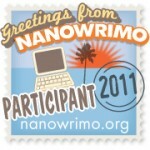 « Previous NaNoWriMo Halfway Update » Next I won! I’ve finished NaNoWriMo! Fabulous tips! I am struggling today. We had a wedding on the weekend and I have fallen behind. Trying to work up the motivation right now but I am afraid I have fallen into a deep hole. Oh well, nobody said it would be easy, right?! Love hearing about your progress. It inspires me to keep plodding on…. Keep slogging away at your marathon. I’m not sure I’ll reach the 50K but I made my initial target of 30K. I’ll have to put in a few mammoth days to catch up again. You are just a little bit fabulous achieving this in between being mumma to a young’un & working. amazing achievement.